Thailand is labeled “paradise” not only for its breathtaking beauty and inspiring culture, but also for its culinary brilliance. From adrenaline-rush Bangkok to serene seaside towns in the South and tranquil villages located along the Mekong River, Thai cuisine is as rich and diverse as its culture. Uniquely crafted to appeal to all tastes, Thai food combines the best of flavors, textures, colors and presentations. Adding this to the country’s liberal supply of ancient cooking secrets and the Thai hospitality and you find a culinary treasure trove that offers enriching and memorable dining experience. Discover fine, gourmet dining in Bangkok and throughout Thailand’s popular tourist locations. 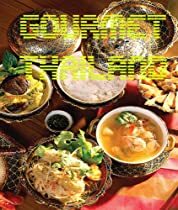 Prepare your own Thai food using the 10 mouth-watering, authentic Thai recipes included. You can even learn where to find the best street food in Bangkok and where to learn Thai cooking on your next holiday in the Land of Smiles.